On September 17 Turkmenistan will host the country's largest ever sports tournament, the 2017 Asian Indoor and Martial Arts Games. Over 6,000 ahtletes from 60+ countries and an estimated influx of 150,000 foreign tourists should boost the country's international profile, which is why preparation also took an unexpected scale. After the selection of Ashgabat as host of AIMAG back in 2010, work began almost instantly on what would become one of Asia's most impressive sports complexes. Olympic in terms of spending, though not meeting actual IOC rules for Summer Olympics, the sports center was to span across 147 hectares and by 2016 was estimated to cost $5 billion, absolute record of spending for any AIMAG tournament. It's a controversial expense especially when you take into account that money shortages led to taxpayers being forced to contribute directly, as if the whole thing wasn't built with their funds from the start. Some people have been reported to have 15-20% of their wages withheld and redirected for the project. Turkmenistan's first AIMAG becomes even more controversial with the severe accusations from Amnesty International, who point out that thousands of people have been forcibly evicted in various areas of the city, sometimes with only a few days notice, in order to 'beautify' the city. Back in the southern Olympic complex everything looks flashy and new, especially by night. The old main stadium, though not actually needed to host AIMAG, was initially only planned to receive an upgrade. 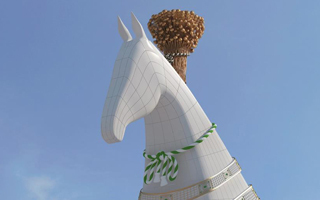 Most notably, it was to have a giant horse's head fitted onto the roof's northern part. Later it was planned that the upper tiers of seating would be torn down and rebuilt with larger capacity. Eventually, by late 2013, all of the stadium was demolished after just 10 years in operation in order to build a new one from scratch. In its place the largest single sports building in Turkmenistan has been built. While not Olympic in size, it's commonly referred to as the Olympic Stadium, despite its “only” 45,000 seats. Its scale is indeed impressive, largely thanks to the aforementioned horse head, referring to the country's symbol - ahal teke horse. The white-clad head has a footprint of 1,200 square meters and adds massive 600 tons to the roof's overall weight. The torch (actually the second one, first had to be dismantled) sticking out of it tops at 82 meters above ground, making it one of the city's tallest buildings. The rest of its roof is between 40-50 meters in height and, despite being covered with lightweight PTFE membrane, is rather heavy. The steel structure based upon 16 main girders, weighs some 10,500 tons. All of the stadium, as the president Gurbanguly Berdimuhamedow prefers, has been covered in white (partly white marble) and offers arguable aesthetic impression with its lavish gold signage and various decorations. Well before stadium construction was launched, works were well underway for other elements of the sports village, which has a size big enough to host an internal monorail of 5.2 km, with 7 stations. Aside from the main stadium there are two 5-star hotels here, 14 indoor halls of different sizes and many other venues split by cheerful alleys with fountains. Is it all worth it? Extremely unlikely. We've tried our best but came up empty in terms of any legacy plans for the entire complex. While it's easy to imagine Ashgabat's residents making great use of the minor sports halls, what what's the need for a 45,000-capacity stadium if the former one was hardly ever full?